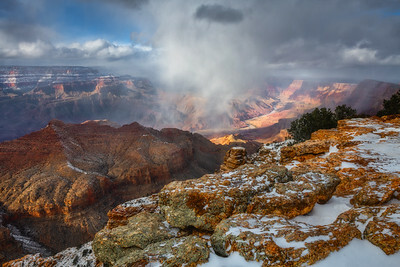 This image was taken after a recent snow storm at the Desert View Point in Grand Canyon National Park. It was bitterly cold but the scene was mesmerizing as the sun played hide and seek with the clouds constantly revealing different shades of the valley. 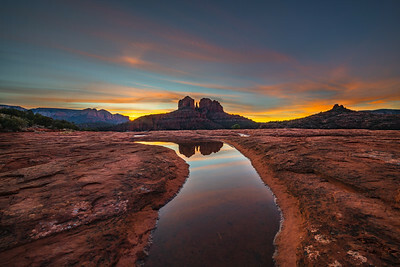 This is one of my favorite spots in Sedona especially after rain as the red rock assumes an even darker color. 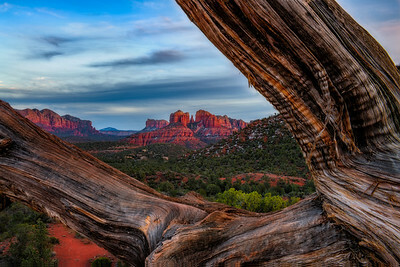 This juniper tree offered excellent opportunities for framing Cathedral Rock so I could not resist the opportunity. In practice it proved a lot harder getting both the tree and Cathedral Rock to be in focus. This ended up being a composite of two images. 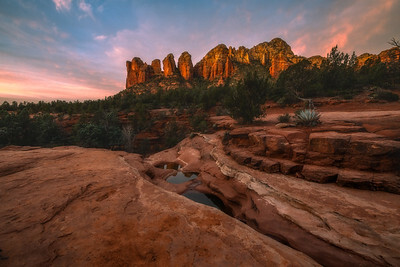 The Seven Sacred Pools on the Soldier Pass Road and Trail is an easy hike in Sedona. I found this majestic tree at the location that I could not resist photographing. 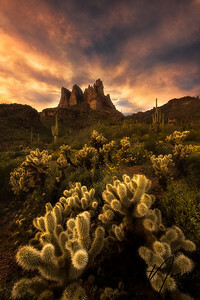 Getting there for sunrise is a bit of a challenge as there are gates to the trailhead that do not open till much later. 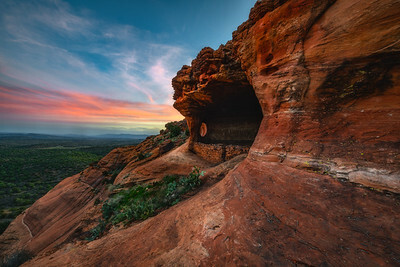 We got to enjoy a beautiful sunset at this location called the Robbers Roost in Sedona. Getting here requires a 4WD high clearance vehicle for the last one mile of the drive. The trail that leads to the roost is short – only 0.4-mile one way – but steep and rocky. 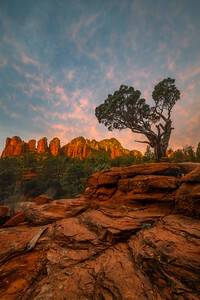 Another image from a wonderful sunset at Robbers Roost in Sedona. The trail that leads to the cave is short – only 0.4-mile one way – but steep and rocky. There is a small part at the end of the hike that requires traversing a sloping ledge with a several hundred feet drop off. So caution is advised. 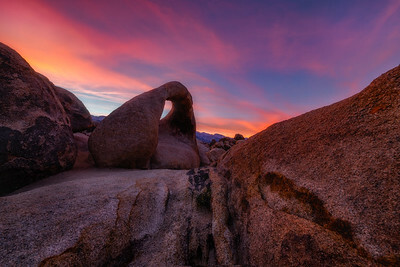 I was fortunate to spend an evening in Alabama Hills and capture this sunset at Mobious Arch. 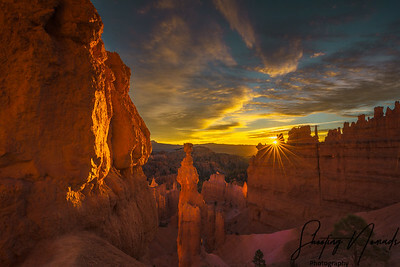 As many of you know the rock formations here are totally amazing with the Eastern Sierra Mountains gracing the background. 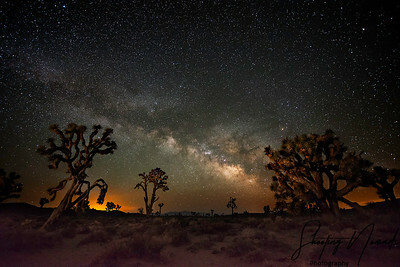 Throughout the last century, the Alabama Hills have appeared in hundreds of films with even a recent Quintin Tarantino project being shot here. 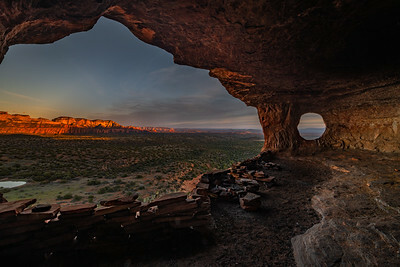 There are several other arches in the area and I hope to back in the future to photograph them. 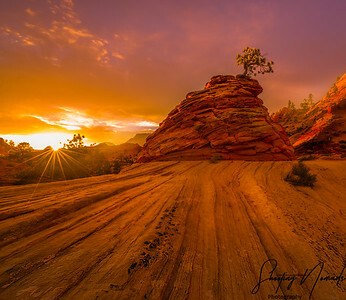 A beautiful sunset at a location near Bishop. 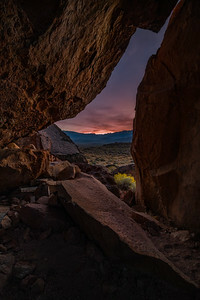 One of the many unique sights in the Red Rock Secret Mountain Wilderness is a series of natural pools, reached by way of an easy hike from Soldier Pass Road and Trail. Seven Sacred Pools - Sedona, Arizona The Seven Sacred Pools were naturally carved out of ocher colored sandstone and fed by a seasonal stream. 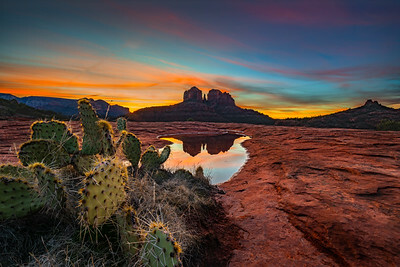 In this transition zone between the Oak Creek Mountains and Sedona's arid desert land, the pools are a very important water source for the area's wide variety of wildlife. 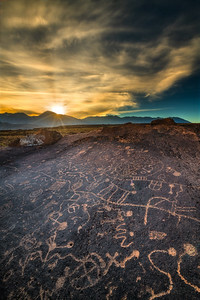 The Sky Rock Petroglyphs located near Bishop, CA are a special and scared place indeed. 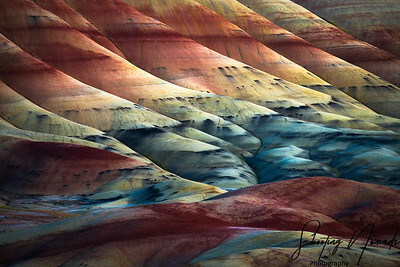 Sky Rock is kept secret from the general public due to its special patterns and its rarity. 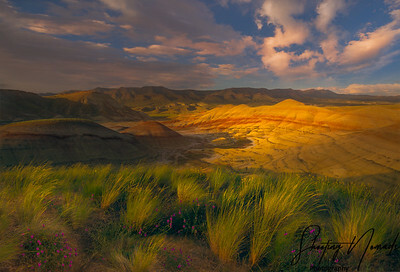 Those people in “the know” don’t share its location so that fewer people will visit and its condition could be kept as pristine as natural forces allow. After a fair bit of searching online, I was able to narrow down the possibilities. So, off I headed for a hike not sure how things would pan out. To my pleasant surprise I was able to locate the petroglyph without too much trouble (Phew!). It was fascinating to see the enormous petroglyph firsthand and consider the artist who, probably many hundreds of years ago, composed the intricate petroglyph forms. I have to admit that standing alone above Sky Rock taking in the extraordinary distant views of the High Sierra and the overall magnitude of the high plateau was very inspirational. A beautiful sunset made the evening even more special! 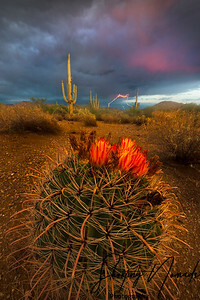 I had travelled to the area several times waiting for the flowers to bloom and the blue skies to yield some color. The flowers were not spectacular but finally got this image that I am pretty happy with. 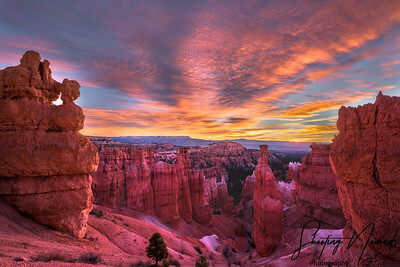 This was my first time to Bryce Canyon National Park and I had driven through the pre-dawn hours not knowing what to expect. It was a toss up between Sunrise Point and Sunset Point. Not knowing which one to pick, I bet on Sunset Point and it what a sunrise it was. 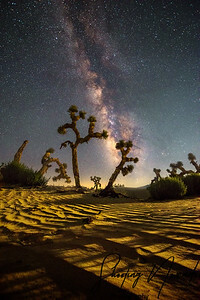 This one was taken somewhere in Death Valley National Park. A quarter moon lit up the scene for a short while making this shot possible. 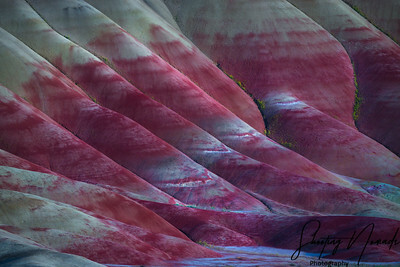 Abstract from Painted Hills, Oregon. 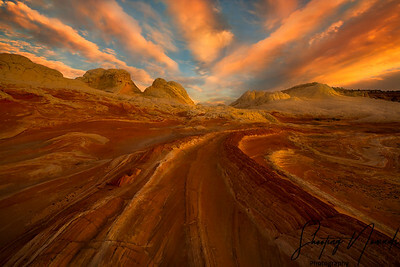 This is an amazing place to photograph with the right light.